Sharon got pretty excited tonight when she was cruising through her Craftsman Magazine pictures and she found this photograph from the February 1913 issue (p. 582). 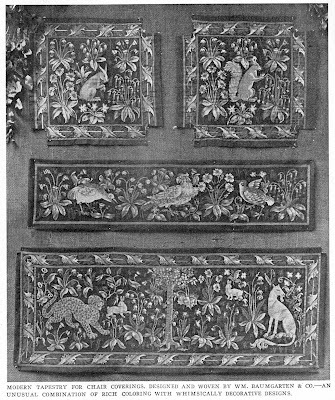 Modern Tapestry for chair coverings, designed and woven by W.M. Baumgarten & Co.
-- an unusual combination of rich coloring with whimsically decorative designs. This is extra exciting because we have been debating about what to do with our what-we-thought were non-period tapestries; we bought them over 10 years ago, when we were going for a more Victorian decor. We had thought maybe we would let them go after the remodel, but were reluctant to because they looked so good with the Craftsman colors (and we like them, of course). Now—woo hoo—we have evidence that Stickley approved of this choice! 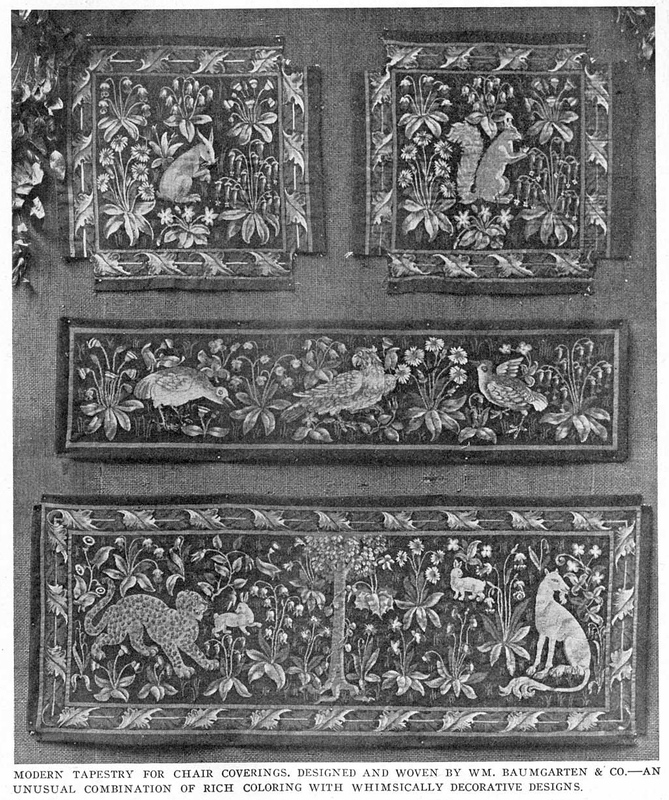 This will probably send us more in the direction of the English Arts & Crafts movement (William Morris, et al.) in our decor. The tapestries do look appropriate in your house. It is important to reflect your own sensibilities so your home doesn't look like a house museum. You guys have certainly been busy! So many updates to catch up on . . . I've seen the picture of your mantel tapestry before and immediately thought that it was beautiful. It has an early Arts and Crafts William Morris / Dante Gabriel Rossetti feel to it. I recently missed out on a "Lady and the Unicorn" tapestry at a local online auction. I thought that it would have looked really good in our house.